cream butter and sugars together until light and fluffy, 3-4 minutes. add milk, egg and vanilla extract and mix until well combined. add dry ingredients and mix thoroughly. dough will be thick. grease a mini muffin tin. make balls of about 2 large tsp in size and press into the bottom of each mini muffin cup. press the center down just a bit to make an indention, where you’ll add the mini snickers later. you want each cup to only be about 3/4 full. bake at 350 degrees for 8-9 minutes. remove from oven (the centers may look a little undone, but they will cook more as they sit) and press mini snickers into the center of the cookie cups. allow to cool for 3-4 minutes in the muffin tin. the mini snickers will start to melt. remove cookies to a cooling rack to finish cooling. to make the icing, beat the butter and shortening together until smooth. add the powdered sugar to the butter mixture, one cup at a time, and mix until smooth. add peanut butter and cocoa and mix until smooth. add 1-2 tbsp of water until the icing is the right consistency. 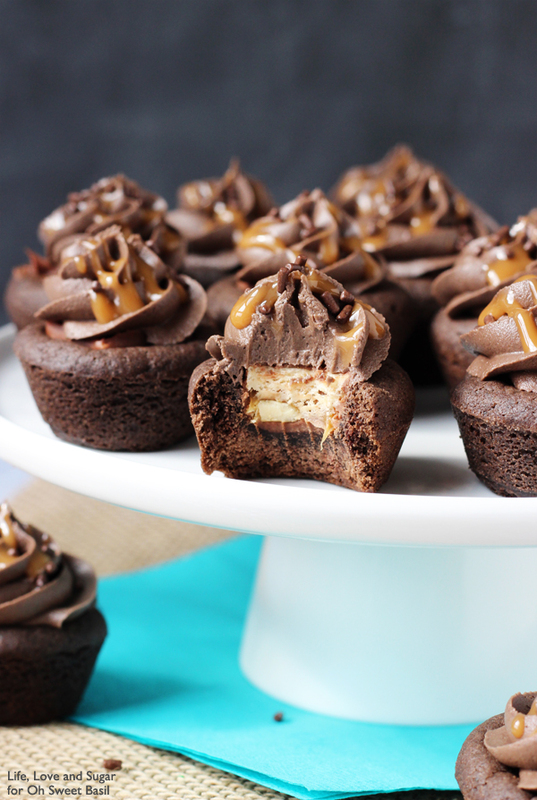 top the cookie cups with the icing, then a little bit of caramel sauce.